Exercise. It has taken form in some unique and entertaining trends over the years. Basically, you move in to a house with about an acre of grass that you maintain with a push mower, because $2,000 is a lot of money to spend on a riding mower for a property that you’re renting. BOOM. You heard it here first! On a more serious note, I have another interview today, and it’s for a job/company that I’m pretty pumped about. Please send good vibes! Happy Friday, y’all! Couldn't stop laughing after reading this, ha! Sending GOOD, GOOD vibes your way! I would have still forked over the money because you will definitely be able to sell that bad boy for a good price still. Plus, just think about all the time you will be saving!! Ps- good luck today. You are going to rock it! That looks so intense girl! I'm positive that your interview today went really well, and that they loved you! Good luck with the job! That's so exciting. I am sure you did great! 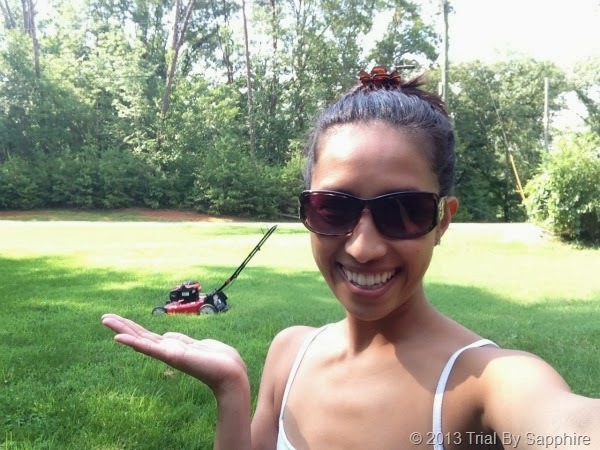 I'm seriously impressed with your mowing skills! I actually kinda like mowing. There's a sense if instant gratification involved. 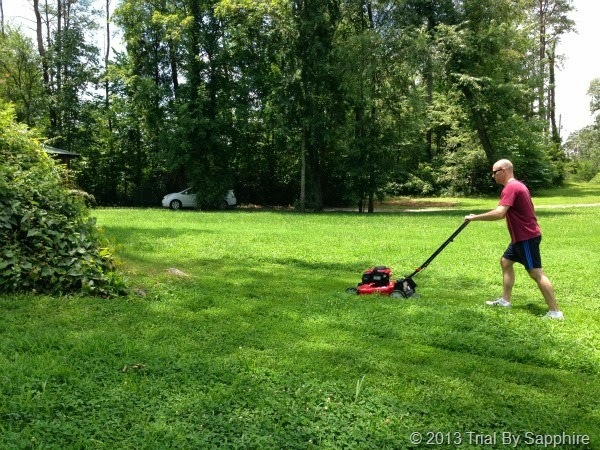 I used to have an old school push (no motor) mower for my tiny Brooklyn backyard. So little grass, so many calories burned trying to tame it. Also, I learned the importance of wearing gloves while mowing. Sometimes it's good to be a city girl. I hope your interview went well. Sending good vibes your way (always :). This kinda makes me wish our grass was real. I love some good outdoor exercise.